Recently, we had a special Diwali celebration at lunch time at work. Diwali, also known as the “festival of lights,” is an ancient Hindu festival. Among other things, it celebrates the victory of light over darkness, knowledge over ignorance, good over evil, and hope over despair. I was very moved by the beauty of the celebration. Many people dressed in beautiful gowns and robes, and they explained the origins of the holiday, how they celebrate it, sang a song, and treated us to AMAZING Indian cuisine. It was, as Springsteen says, a “lovely privilege” to participate in the gathering as the announcer said, “Happy Diwali and may your new year be happy, healthy and prosperous. I bring this up because we are now entering the month of December, which brings with it many holidays such as Christmas, Hanukkah, Kwanzaa, winter solstice, Yule, and other celebrations. Each of these festivities, among the myriad of associated traditions, seem to have a common theme: LIGHT. Without getting too preachy (who, me?) We are living in dark times. School and public shootings are now – Heaven help us – routine. The horrific terrorist attacks in Paris were only a few weeks ago. Every day, news reports seem to indicate that the world is no longer safe, and the darkness is winning. Nearly three years ago, when I wrote about the Sandy Hook shootings, which happened only a few days before Christmas in 2012, I noted that each December each year we argue whether it’s a holiday tree or a Christmas tree or a Yule tree. I added that the argument really didn’t matter – what we can ALL agree upon is that we just want to be safe. WHATEVER you choose to call that tree we light up every December, it lights up the darkness. Religious connotations and history aside, right here in 2015 we see homes, businesses, and trees bursting in beautiful colorful lights –these cheerful displays illuminate the darkness, and lift our spirits. It is indeed better to light one candle than curse the darkness. It’s why candlelight vigils after a tragedy are so powerful. It’s why the tradition of putting a candle in the window for someone is so meaningful. It’s why we light candles for countless rituals, celebrations, prayers and even birthdays. There is power in that light. There is also hope. Decorate the Common! Start off your morning by spending some time with neighbors and friends sprucing up our town for the holidays. Foxboro Common 9:00 a.m. to Noon. Join the Jaycees on the common and help decorate our common with lights, bows and garland around the lamp posts. To be sure, many of these activities are “Christmas – centric” – but especially given the dark and tragic news stories that constantly bombard us, the racism and cultural attacks that we read about every day, the human unkindness we are seeing everywhere, how about gathering together and celebrating COMMUNITY and LIGHT? 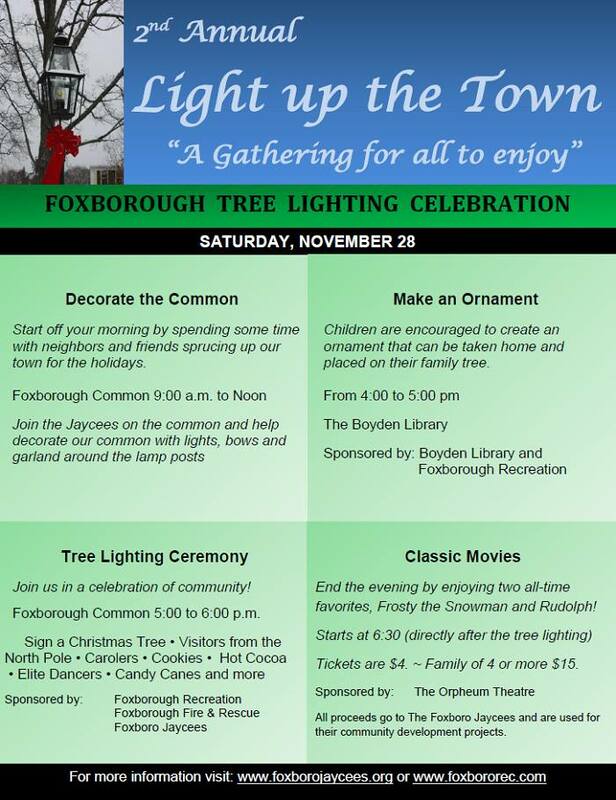 Call that tree on the common anything you want – it doesn’t matter – but it 5 o’clock on November 28, were going to flip the switch and light it up, and the bushes around the bandstand and the foot of the common will also be ablaze in festive bright light until early January. There is great power in COMMUNITY GATHERING. If you attend any of these events that day, you will be amazed by the feeling of COMMUNITY. Just by being there, you’re creating good energy. Your part of a nice event. You’ll feel better. And with that power we start to make a difference, even in small ways. This holiday season, regardless of what you do or do not celebrate, take some time to look at the LIGHTS everywhere. The Hanukkah menorahs, the festive holiday lighting, the bushes and trees in so many neighborhoods brightening the cold winter night. I hope you will join us for one or all of the events on November 28. Join us for a festive community event. Say hi to your neighbors, enjoy the light, and lift your spirits. Spread the light and good energy. Hope to see you there!